Last week in the social entrepreneurship class I teach, we started our current events discussion like any other, but the events in Parkland, Fla., and the resulting outrage around gun reform overshadowed every other headline. My students discussed it as I had taught them – as social entrepreneurs. What is the problem? What are the underlying causes? What does the research say? Why are we stuck as a society? But, I could tell something was missing. My heart sank when I finally got it. The (mostly) millennial students in my social entrepreneurship class have never experienced real social change and have grown up post-9/11, fearing terrorists and school shootings. My generation – Generation X – remembers when driving without seat belts was the norm, smoking in restaurants and offices was commonplace and drunk driving was the leading cause of traffic deaths. 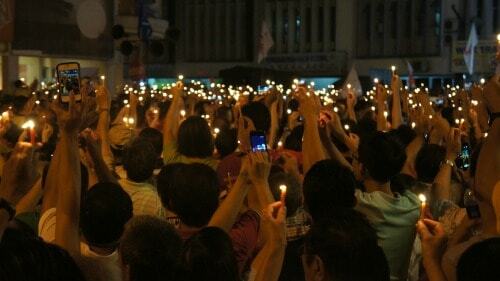 I know social change can happen because I witnessed it firsthand, and I helped shape it. This post is as much a reminder to me as it is a lesson for my students about how real social change happens. When we have social issues that impact all of us, champions – much like the courageous teenagers in Parkland, Fla. – stand up, alert us to the problem and create movements. In the case of drunk driving, it was a mother, Candy Lightner, who lost her 13-year-old daughter, Cari, in 1980 because of the actions of a drunk driver. She channeled her grief into establishing MADD (Mothers Against Drunk Driving), which led to heightened awareness and the passing of legislation to raise the legal drinking age to 21. Because of her and many courageous advocates across the country, drunk driving fatalities have been cut in half – from 21,000 in 1980 to 10,300 in 2016 – saving more than 300,000 lives. It is one of our proudest public health victories and is being replicated worldwide. MADD is celebrating its 38th anniversary this year. But, how did we get this change to happen in such a short amount of time? As we have studied this success, researchers have found and perfected a model that accelerates the pace of social change – the socio-ecological model. I have lovingly used it for the past two decades, calling it the “social ripple effect” (inspired by the quote from Mother Teresa: “I alone cannot change the world, but I can cast a stone across the waters to create many ripples.”). It provides a comprehensive framework for understanding and modifying the range of social and environmental factors that have an effect on individual human behavior. It shows that, while individual behavior change is hard and something we still are trying to understand, humans are shaped overwhelmingly by their environment. Each level is critical, and interventions are more effective as they address risk and protective factors at multiple levels in concert with one another. The social ripple effect model showcases the synergy needed to create large-scale social change – where we can co-create an environment that supports individual change, and individuals can create a chain reaction to stimulate change within their environment. Through educational programs at schools, they created a new generation of educated and aware drivers. Through the “Friends Don’t Let Friends Drive Drunk” campaign, they created a social support network that made friends and family feel responsible for the actions of individuals. Many efforts even encouraged party hosts to take guests’ keys at the door. Through efforts at schools and churches, they succeeded in changing group norms by offering “drug-free” parties and proms. Schools also started on-campus clubs that encouraged students to sign drug-free pledges. Through efforts to educate bar owners and staff, they developed programs to help identify people who were intoxicated, stop them from drinking and encourage them to use alternate transportation. Through lobbying efforts, they increased city officials’ awareness of the problem and encouraged them to enhance efforts to apprehend people driving under the influence during holiday weekends. Through PR efforts, they encouraged the media to assist in making more people aware of the problem and discouraging the behavior. The media featured dramatic stories about families who had lost loved ones due to drunk driving. Through lobbying efforts, they were successful in getting the federal government to decrease the accepted level of intoxication to .08 and increase the minimum legal drinking age to 21. They also tied the receipt of federal transportation dollars to each state’s compliance with this standard. 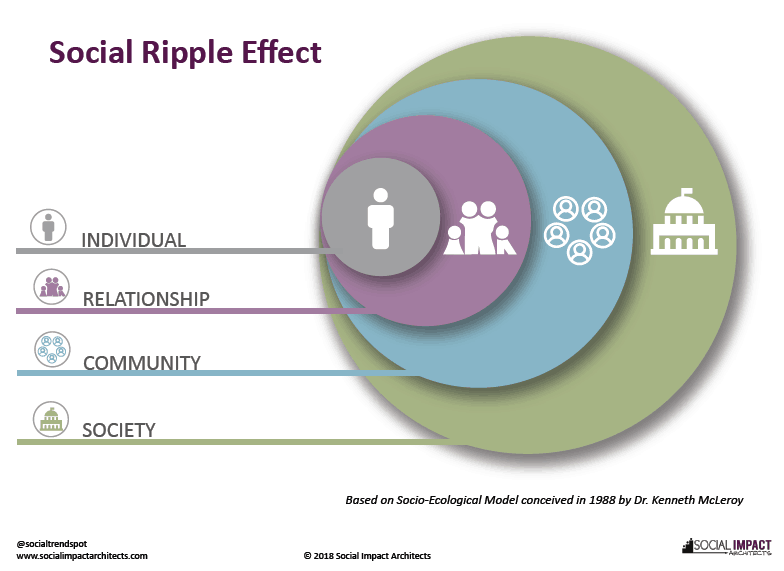 The social ripple effect (or socio-ecological model) has evolved beyond public health and is now used more universally in areas such as: domestic violence, obesity and chronic disease, and early childhood development. As illustrated above, the social interventions that target the outer levels of the model (i.e., community, societal) can improve individual status by modifying underlying factors that influence the individual. This often yields greater impact than focusing on the individual alone. We encourage organizations and communities working toward large-scale social change to chart their efforts against this model and look for ways to take them to the next level. As Mother Teresa noted, each level can “create many ripples” and cumulatively those ripples can lead to change that matters. We welcome your input on this model as well as others that move your work forward.